It’s not easy running a country – governments have a difficult job. They have to take care of the health, wealth and security of millions of people, and unfortunately for them, the better they are at it, the more people seem to expect from them. They’re also the first people to take the blame when things go wrong. But, it is certainly true that some governments aren’t quite up to scratch. Some are better at governing than others. But which? What yardstick would you use to determine this? GDP? Lack of corruption? Health of the citizens? Or would all of this be irrelevant in comparison to the happiness of the people? The Kingdom of Bhutan in South Asia has placed Gross National Happiness as its chief concern, over financial issues. They avoid environmental destruction, and try to preserve the culture and traditions of their country, to foster a strong national identity. That’s a pretty interesting stance to take, compared with the the money-focused west. I wondered whether the people of Bhutan are happier than westerners are, so I tried to find out. 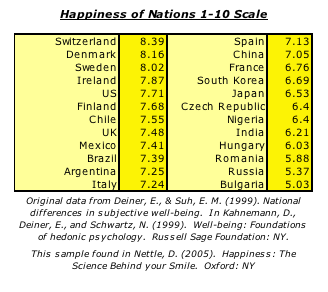 The first data I found looking happiness and nation was in Daniel Nettle’s book, Happiness: The Science Behind your Smile. By the way, that book is well worth getting – it’s cheap and a quick read (you’ll probably get through it in an evening), yet it manages to cover the happiness research comprehensively without being too technical. Here’s the average happiness scores on a 1-10 scale. Find your country! Note that the original data is from reference (1). Looking at the table, Switzerland came out top, and Bulgaria lowest in this sample of countries. The lower scoring countries are the poorer ones and the former communist ones – all the events and changes that took place in these countries seem to have given the people some understandable discomfort. I expected Japan to be higher as I’d heard many good things about the quality and ease of life there. The UK are high in the list, which is good to know since I live here, although we might be helped out by the Irish, as I recall another study which said Northern Ireland was the happiest country within the UK. The US, along with its constitutional right to pursue happiness, is up near the top too. Why are these countries happier? So what is it about how these countries that makes the differences in happiness? The most obvious difference is wealth; countries in poverty are far less happy overall than the wealthier ones. But the correlation isn’t completely linear, because once countries are out of poverty, the benefits of wealth level off. This is a problem with the western ‘pursuit of property’ culture, which involves getting as rich as possible and using the money to make better homes, sanitation, central heating, and other comforts. It works, until the basic needs are met. Then the benefits tail off – it seems like money can only get a country to a certain happiness point, after which we adapt to further luxuries. According to this study, Bhutan ranked 8th out of 178. If this is correct, it’s impressive, considering Bhutan has one of the lowest GDP’s (on the map, Bhutan is the tiny dark red country, bordering with China to the north and Bangladesh to the south). However, there is some controversy over this paper. Apparently, in the original study from which the map was made, data did not exist for 80 of the 178 countries, and the happiness levels were simple estimates. This complicates things, because it isn’t clear whether Bhutan was one of the countries that was estimated. So the money-focused west appears to be happier than the GDH-focused Bhutan; but Bhutan does better than other countries of a similar wealth. Marks also mentioned that there’s a new Happy Planet Index coming out next month. I’ll probably get that, because the HPI is such an interesting concept. They combine life-satisfacion measurements with ecological efficiency. Their aim is to discover whether it’s possible to use a country’s resources in an efficient way, to bring happiness to the people without damaging the environment. The rich west may have happier people generally, and better health, but these countries also have a far larger impact on our planet’s environment. So in the HPI, these countries would be penalised. Presumably this is why it’s called Happy Planet Index – it measures how ‘happy’ the planet is as well as the people on it. The global HPI map can be seen here. Comparing this to the previous map, you can see that the golden bubble of north America, western Europe and Australia take a hard hit when environmental impact is added in. (it’s confusing but the colour scheme changes – red is bad in the HPI graph but good in White’s happiness one). Who comes out best in the HPI? Vanatu is first, with Columbia second and Costa Rica third. Switzerland, our leaders in happiness, fall to 65th place, while the US falls to 150th. The UK is at 108th place. The implication is interesting. Happiness, for many people, is life’s ultimate goal. Particularly materialists, who do not believe in anything other than matter. Ayn Rand would be happy with that reasoning – if there’s nothing else to existence but the physical world, then your own happiness may be the highest goal – along with a sense of morals that involves not interfering with another’s happiness. Many people have belief systems that transcend normal human experiences (religion, spiritual beliefs, and so on), and they have their own reasons for believing in a higher goal than happiness. But if a materialist agrees that pursuing happiness should include the clause of not interfering with another person’s happiness, this logic has to include people who don’t yet exist. What’s the point of having a happy nation if the next generation are unhappy because of it? If it’s not right to go up to someone and knowingly make them unhappy today, it must also be wrong to knowingly make someone unhappy who doesn’t yet exist. So finding ways to increase happiness that will not have a negative impact on the happiness of future generations is a higher goal than pure, immediate happiness. This might seem obvious, but I think it’s true that “what’s measured improves”, so I find it interesting and encouraging that there’s a measure of well-being that takes ecological efficiency into account. Keep your eye on http://www.happyplanetindex.org/ next month; the new index is released then! (1) Deiner, E., & Suh, E. M. (1999). National differences in subjective well-being. In Kahnemann, D., Deiner, E., and Schwartz, N. (1999). Well-being: Foundations of hedonic psychology. Russell Sage Foundation: NY. (2) White, A. (2007). A Global Projection of Subjective Well-being: A Challenge To Positive Psychology? Psychtalk, 56, 17-20. Great post! Have you ready The Geography of Bliss? You might enjoy it! Can I question the accuracy of your Happiness Of Nations Scale? My country, Australia, doesn’t even rate a mention! Surely my “no worries” nation, with its sun-drenched beaches, rugged mountain ranges, and easy going lifestyle is full of happier people than say, Bulgaria?? If your scale is accurate, and therefore the land of Oz is so unhappy it doesn’t rate, I’d better get off this computer and out into the clean, well-maintained streets and teach my fellow Aussies all I know about being happy. Must dash. No but I just looked it up on Amazon and yes I do think I’ll pick that one up at some point, thanks for that! Streuth! I should have been more clear! The chart shown is just a selection of countries that Nettle used in his book, which I borrowed for the article. The original study from which the data came no doubt did include Australia; though I don’t have it to hand. If you look at this map (you’ll have to scroll down a bit), you’ll be pleased to see Australia is up there with Scandinavia and North America. I know of another study with a much bigger list of countries (in which Australia comes out in third place), I’ll see if I can post that one up later. By the way, Jacqueline, if you’re trying to make me jealous with your descriptions of sun-drenched beaches and rugged mountains, let me assure you, it’s working. Here in England we have rugged beaches and very few mountains. Nah, I’m joking, I love it really. Rain can be very refreshing. happiness is too subjective and people may say they are happy even if they are not (and vice versa) depending on cultural norms. A simplistic meaning of happiness may also not be useful. Many creative people have been known to produce their best and most profound work when they are not happy but troubled with various problems/thoughts. .-= tempo dulu´s last blog ..Why are some countries richer than others? =-. These are interesting issues, but I’d have to disagree with you on these. Yes, there may be some static coming through with some people saying they are happy when they are not, and this is a very common criticism of happiness measured in this way. But the happiness questionnaires, although not perfectly accurate, are pretty well validated against everything from observer reports, to how much a person smiles, to activity in the left pre-frontal cortex, where positive emotions are thought to be processed. And at the same time, I think this subjective appraisal should be measured. For example, just as a thought experiment assume that it is possible to measure happiness objectively, and say my happiness is 6, but I tell you it’s 8. This means that although my happiness is 6, I’m happier with that level and all the things that result from it than someone who answered ‘accurately’. Do you not think that my own appraisal of my happiness and life situation should be taken in to account? See this post for more. As for the creativity, yes you’re right about the troubled artist stereotype, but it’s certainly not the case that everyone with troubles suddenly becomes creative. Most people do not. Yes, it sounds strange but you can tell how happy people are with a question. It’s better to use a validated questionnaire, but a single question like “All things considered, how happy are you with your like right now?” is still fairly valid. Some people will say they are happy when they are not, some people will say they are sad when they are not. But one argument is, that judgement of how happy they believe themselves to be should be taken into account, and not just the more objective things like emotion. But you’re instinct is right in that one question isn’t the best way. ← Is time management important for students?